(MEMPHIS, Tenn. – Oct. 23, 2018) St. Jude Children's Research Hospital investigators have developed a new class of compounds that extended the lives and eased symptoms of mice with a progressive neurodegenerative human disorder. The findings appear today in the journal Nature Communications. The rare, inherited disorder, pantothenate kinase-associated neurodegeneration (PKAN), affects up to three in a million individuals and is caused by mutations in the PANK2 gene. Iron accumulates in brain cells, and patients have difficulty walking, swallowing, chewing and performing other activities. There is no treatment. PKAN is thought to occur when neurons lack an adequate supply of the molecule coenzyme A (CoA), preventing them from functioning normally. PANK2 is one of three closely related proteins (isoforms) that regulate CoA production. "We have developed a class of small molecules called pantazines that penetrate the blood-brain barrier and elevate CoA levels using a novel mechanism," said senior author Suzanne Jackowski, Ph.D., a member of the St. Jude Department of Infectious Diseases. St. Jude has patented the pantazines and their use for treatment of PKAN and related CoA disorders. The hospital has licensed the compounds to CoA Therapeutics of Palo Alto, CA, which has begun planning clinical trials. CoA is a helper molecule essential for carbohydrate and fat metabolism. "Just like things go wrong when oil in your car gets low, problems develop in cells when levels of CoA get low," said corresponding author Charles Rock, Ph.D., a member of the St. Jude Infectious Diseases department. CoA also plays a role in epigenetic regulation of gene expression, which is disrupted in many cancers. Jackowski has studied CoA production (biosynthesis) and PANK for decades. In 1981, shortly after she and Rock joined St. Jude, they published evidence that PANK was a pivotal regulator of CoA production in bacteria. Then in 2001, research led by Oregon Health and Science University investigators reported that mutations in PANK2 were associated with the neurodegenerative disorder that came to be known as PKAN. Before long, Jackowski was invited to the annual conference of a patient advocacy group and met individuals and families affected by the disorder. "After that, Chuck and I were walking back from lunch in the St. Jude cafeteria one day and I raised the possibility of treating this devastating disease by stimulating or activating an alternative pantothenate kinase to make up for the CoA deficiency." Jackowski said. She was referring to the PANK1 or PANK3 enzymes that can also trigger CoA synthesis. "That's when we launched the side project that led us to pantazines." The researchers joined forces with colleagues in the St. Jude departments of Structural Biology and Chemical Biology and Therapeutics. Co-author Richard Lee, Ph.D., and others in Chemical Biology and Therapeutics, carefully crafted the pantazines based on a compound first identified in a screen of the hospital's library of more than 500,000 drugs and small molecules. The pantazines were carefully optimized to increase cellular CoA levels, cross the blood-brain barrier to reach the affected neurons, work as a pill, and have minimal side effects to become a novel drug candidate for PKAN treatment. 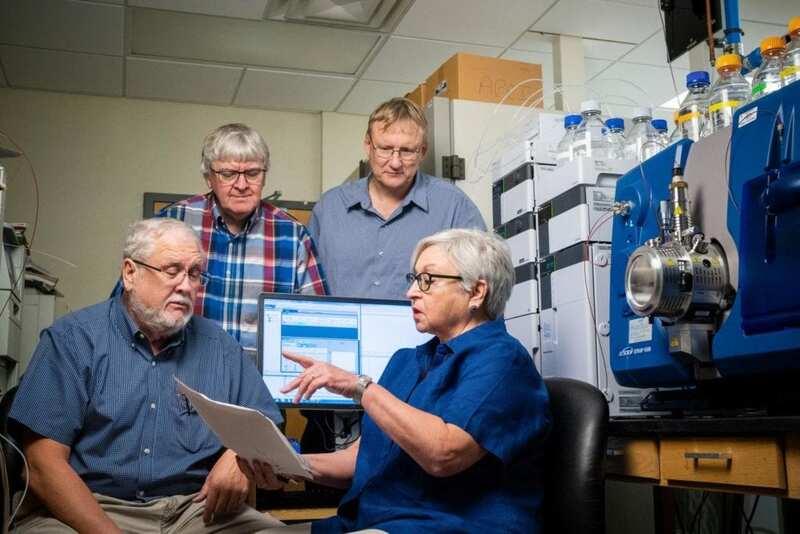 As researchers analyzed possible drug candidates, co-authors Stephen White, D.Phil., and Mi-Kyung Yun of the St. Jude Structural Biology department captured images of candidate compounds bound to PANK to guide compound optimization. The image showed the compound, PZ-2891, bound to the protein structure in a unique way to temporarily lock PANK in the "on" position to promote CoA production. In the laboratory, CoA levels increased in cells treated with PZ-2891. Levels also increased in the brains of normal mice as well as mice St. Jude researchers developed to model PKAN in humans. The treated mice lived longer, grew more normally and resumed walking. There were no apparent side effects. "Science helps us understand how to do medicine," Rock said. "Reading that paper in 1981 about regulation of CoA biosynthesis in E. coli you might have wondered, who cares? But basic research is what made this discovery possible." Jackowski said, "As a basic scientist, you always have the hope in the back of your mind that something you do will reach the clinic and make a difference in peoples' lives. I feel fortunate to be where we are in this project. "We were lucky to be at St. Jude where we are all on a mission to help children with catastrophic diseases and have been given the resources and colleagues necessary to tackle challenging diseases such as PKAN," she said. The first author is Lalit Kumar Sharma, formerly of St. Jude, and now of Nurix Inc., San Francisco. The other authors are Chitra Subramanian and Matthew Frank, all of St. Jude. The research was funded in part by CoA Therapeutics; a grant (CA21765) from the National Cancer Institute, part of the National Institutes of Health; and ALSAC, the fundraising and awareness organization for St. Jude.